For some people standing out can be a bit embarrassing and overwhelming, while for others this is just something that occurs naturally. 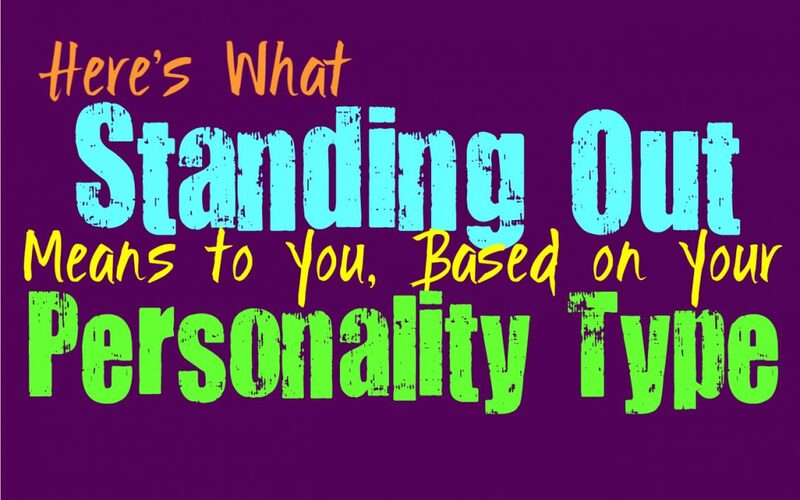 Here is how you feel about standing out and what it means to you, based on your personality type. INFJs do possess certain qualities which can cause them to stand out amongst the rest, but this is not necessarily something they are hoping for. INFJs prefer to be more of a wallflower and can become a bit unnerved if they are center of attention. Standing out leaves the INFJ feelings like people are paying too much attention to them and their behaviors, and this can feel truly overwhelming for them after a while. INFJs are friendly and unique people, but they become quickly drained by having to interact too much with others, unless it is someone truly special to them. ENFJs don’t mind standing out since this is something that often comes naturally to them. Standing out often means avoiding becoming closed from others, and ENFJs enjoy feeling a sense of connection. They want to be someone that others pay attention to, since feeling ignored truly would be hurtful for the ENFJ. They definitely find themselves standing out in most situations and this isn’t something that they are uncomfortable with at all. To the ENFJ standing out just means they are someone who is unique and doesn’t naturally blend in. INFPs often feel different from the rest and so sometimes this does cause them to stand out. They don’t necessarily mind this, but if it causes people to interact with them too much it can be unnerving. INFPs are kind and friendly people, but they become quickly drained by being around others for too long. For the INFP standing out often comes from being a unique person, but when people seek to stand out it can feel completely insincere. They don’t want to be the center of attention for too long, since this can become exhausting after a while. ENFPs are usually people who stand out, even without trying all that much to do so. They are outgoing, charming and truly unique and because of this it is difficult for them to really blend in with the crowd. For ENFPs standing out just means that they easily gain the attention of those around them and most of the time this is perfectly fine by them They don’t like being someone who is easily ignored and pushed aside, since they enjoy being the center of attention in most situations. It is rewarding to have people notice them for who they are and their special way of thinking. INTJs don’t seek to just stand out to anyone or for anything, instead they want to be recognized for the right things. People who simply want to be noticed and stand out, can seem a bit like attention seekers to the INTJ. For them just wanting to be the center of attention and find ways to stand out, is a bit embarrassing and even foolish. When it comes to standing out naturally for your accomplishments and skills, not this is something the INTJ can stand behind and be proud of. ENTJs do enjoy standing out as long as it is for the right reasons and not just in order to gain attention. When they have accomplished something impressive they enjoy being someone who stands out for what they have done. ENTJs also are fans of being able to stand out in ways that others seem to blend in. They don’t want to mediocre people who simply fade into the background, instead they want to their strength and determination to be things which cause them to stand out. INTPs often have conflicting feelings about whether or not they want to really stand out. While INTPs don’t want to feel ignored or pushed aside, at the same time being someone who stands out too much can be unnerving and even frightening. INTPs can often consider the negative side of standing out too much, since this means they can easily get themselves into trouble. INTPs analyze things rather often and this leads them to seeing the downside in most things, and so standing out to them can often lead to not so great results. ENTPs don’t mind standing out, since this is often something that comes naturally to them. They might not make it obvious or well-known to others, but ENTPs don’t like having to blend in all that much. For the ENTP standing out means they are following their own path and feel free to completely be themselves without reservation. They don’t like having to feel held back, instead they seek to experience life and do the things that fulfill their passions. For the ISTJ standing out too much can seem a bit pointless and even selfish. They don’t seek to be someone who is in the spotlight all of the time, especially for pointless things. ISTJs enjoy being on their own in most situations and so standing out simply means they have to communicate and interact with people far more than they want to. ISTJs are more fulfilled being able to do their own things with their loved ones, instead of constantly having to deal with people and socializing. For the ESTJ standing out can certainly be a good thing, especially if they are standing out because of their accomplishments. ESTJs aren’t people who will simply blend into the background for fear that they will stand out too much, instead they prefer being out in the open. They are focused on accomplishing their goals and so they enjoy having people recognize them for this. ESTJs don’t like when people simply seek to stand out because they want attention, but standing out for positive things is entirely different. ISFJs don’t really seek to stand out too much, since they are more focused on tending to the needs of others. For them being someone who stands out can mean even more pressure on their shoulders to be perfect for those around them. They aren’t necessarily afraid of standing out if it is something their loved ones would be proud of, but it might not be something they actively seek. They can be somewhat reserved and practical people, and so much pressure on them can be a bit overwhelming after a while. ESFJs aren’t afraid of standing out, especially if being someone others pay attention to is something that will make their loved ones proud. ESFJs simply seek out perfection in most things they do and want to be able to provide for the people they love. They don’t like letting others down and so to them standing out can sometimes mean even more pressure to succeed. If the ESFJ blends in too much they can feel like they are boring, and this also isn’t something they want for themselves. ISTPs don’t really seek to stand out in most situations, since this often means more attention in their direction than they really want. ISTPs prefer to be independent people who can experience things on their own terms. They become drained rather quickly being around others and dislike having to constantly socialize with people. For the ISTP being on their own is just more fulfilling and so they don’t seek to stand out. ESTPs do often have personalities which stand out around others, since they are outgoing and friendly people. They enjoy being able to experience new things and don’t like having to restrain themselves for the sake of others. They easily stand out around most people, and this is something that just comes naturally for them. To the ESTP standing out just means they are intense people who aren’t boring at all. ISFPs don’t mind standing out a bit, since they have rather bright personalities. For the ISFP standing out simply means they are unique people with special personalities. They don’t like hiding from those around them, and have rather open personalities. For the ISFP it isn’t necessarily a bad thing to be someone who stands out, especially if it is for the right reasons. They simply believe in being themselves and if that means they will stand out, that is perfectly fine. For the ESFP standing out is just something that comes naturally for them, and they wouldn’t have it any other way. ESFPs don’t like having to hide from others or dim their light because it would make someone uncomfortable. They believe in being themselves and they enjoy being able to express their feelings and intentions openly. For the ESFP standing out is a rewarding and fulfilling thing, which allows them to feel more comfortable in their own skin.